The unique space rose note is now a perfume fragrance ingredient. The flavors and fragrance industry is always seeking new ways to dazzle and delight consumers senses. One company launched itself ahead of the competition by collaborating with NASA to create a new fragrance ingredient that is literally out of this world. International Flavors and Fragrances (IFF), Inc., of New York, New York, discovered this new scent, known as the space rose note, by flying a miniature rose plant, called the Overnight Scentsation, aboard NASAs Space Shuttle Discovery Flight STS-95. IFF is the leading creator and manufacturer of flavors and fragrances used by others to impart or improve flavor or fragrance in a wide variety of consumer products. The Wisconsin Center for Space Automation and Robotics (WCSAR) at the University of Wisconsin-Madison, a NASA Commercial Space Center (CSC), is managed by the Space Product Development Office at NASAs Marshall Space Flight Center. WCSAR is the leading NASA CSC for the development of space-based plant research technologies/facilities. IFF and WCSAR partnered to fly the rose plant in a commercial plant research facility for reduced-gravity environment research. The facility, known as ASTROCULTURE,TM was developed in the mid-1990s by WCSAR, and was later modified to incorporate IFFs proprietary technology related to sampling and analyzing essential oils. Although it was understood that plant physiology/biology changes in microgravity, there was no research on gravitys effect on essential oils (or volatile compounds) produced by living flowers, which provide all flavor and fragrance. Therefore, IFF set out to use the rose plant to examine what would happen to the production of essential oils in microgravity. The company expected the experiment to cause a shift in the scent of the rose, because gravity would no longer hold the plant oils in the stem. Even a slight shift would open up thousands of possibilities through combinational chemistry. The end result, however, was much bigger than the company anticipatedthe researchers discovered that the rose had produced an entirely new scent that was definitely not from Earth. 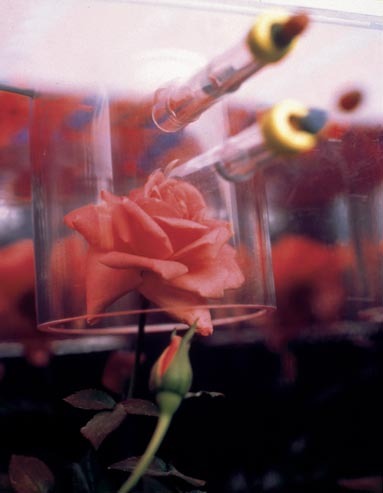 IFF has commercialized the unique space rose note, which is now a fragrance ingredient in a perfume developed by Shiseido Cosmetics (America), Ltd. The perfume, called Zen, combines three notes for a fragrance that the company describes as floral, woody, and spiritual. While this is the first commercial use of the space rose scent in a fine fragrance, further uses are anticipated. In addition to providing a light, crisp scent to the fragrance industry, the space rose oil can enhance food products flavors, offering new opportunities to the flavors industry. The rose experiment demonstrates a successful collaboration between a commercial entity and a NASA-sponsored CSCa strong illustration of how commerce can benefit from space-based research. Results from IFF and WCSAR collaborations during the summer 2002 Space Shuttle mission investigations are expected at a later date. ASTROCULTURETM is a trademark of the Wisconsin Center for Space Automation and Robotics.